There hasn't been any luck with launching a Bitcoin ETF thus far, but Van Eck Associates Corp. and SolidX Partners Inc. hope to change that. Today (June 6), the firms filed a request to list a Bitcoin-linked exchange-traded product (ETP) with the Securities and Exchange Commission, according to Bloomberg. The share price will be $200,000, so this will not target typical retail investors. 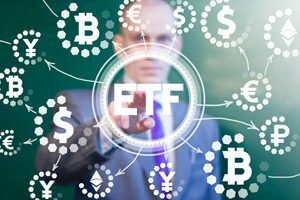 However, approval could lead to other Bitcoin ETFs hitting the market, bringing in more people to the crypto market. In other news, Susquehanna International Group announced it will begin providing cryptocurrency trading options to its clients. Susquehanna, one of the world's largest investment firms, is the latest institutional investor to bolster its presence in the space. The firm first experimented with Bitcoin back in 2014. From today's prices of $7,548.06, he expects BTC prices could climb to $100,000. The U.S. Commodity Futures Trading Commission has denied a Freedom of Information Act (FOIA) request for subpoenas related to the cryptocurrency exchange Bitfinex and the stable coin Tether. The FOIA request is for "subpoenas issued to iFinex Inc. also known as Bitfinex and its subsidiary companies, as well as subpoenas issued [to] Tether Limited and its subsidiary companies." The financial services industry is speaking out against Alphabet Inc. (Nasdaq: GOOGL). Executives in the sector argue that Google's ban on cryptocurrency marketing is an unethical and ill-conceived notion. Philip Nunn of Blackmore Group said that the ban is clearly not based on concerns about criminal activity. "I understand that Facebook Inc. (Nasdaq: FB) and Google are under a lot of pressure to regulate what their users are reading, but they are still advertising gambling websites and other unethical practices," he said. Nunn believes that the ban is really motivated by plans at both organizations to launch their own cryptocurrencies and stave off competition. The cryptocurrency startup Circle wants to register as a federally licensed bank in the United States, according to Bloomberg. It's also seeking to register with the SEC to operate as a brokerage and trading platform. Circle said it would likely seek SEC regulation before applying for a bank license. This is another bullish development for the crypto space, as it will bring in more money.